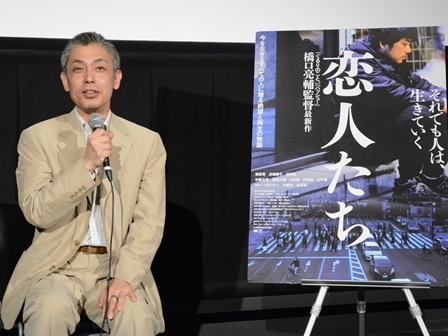 Director Ryosuke Hashiguchi’s first film in seven years, Three Stories of Love was revealed on October 28 as part of the 28th Tokyo International Film Festival’s Japan Now section. In the end, Hashiguchi settled on three main characters—a highway bridge inspector who lost his wife in a passerby killing, a housewife who is fed up with mundane lifestyle, and a gay lawyer who anguishes over the feelings he has for a friend—and spun a tale of their individual struggles and aspirations. While Ken Mitsuishi, Lily Franky and other veteran actors support them from the side “About 80 percent of the cast were workshop members and among them, there were some complete novices. If they were said to have done poorly, it would have been our failure, so it was important to maintain a balance to make it feel like they were all living in the same world.” he explained. Three Stories of Love will be screened at Tokyo Theatre Shinjuku from November 14 and subsequently nationwide.